The Friday’s session remained dominated with bearish undertone as the Markets extended its losses in the second half of the trade while the NIFTY closed with a net loss of 104.75 points or 1.02%. NIFTY has slipped below its 50-DMA which stand at 10183. Going into trade on Monday, the Markets are poised at a little tricky situation. We might see a very modestly positive to flat opening on Monday. Shorts are seen being added to the system. Given the fact that the 100-DMA remain in close vicinity at 10063, Markets may attempt to take a respite from the current spate of weakness. On the other hand, the levels of 10180-10200 will pose a stiff resistance on the upside. 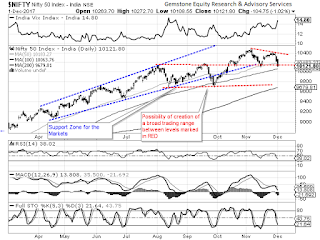 The levels of 10165 and 10210 will act as immediate resistance levels for the Markets. The supports come in at 10060 and 9975 zones. The Relative Strength Index – RSI on the Daily Chart is 38.0201. It has marked a fresh 14-period low which is bearish. 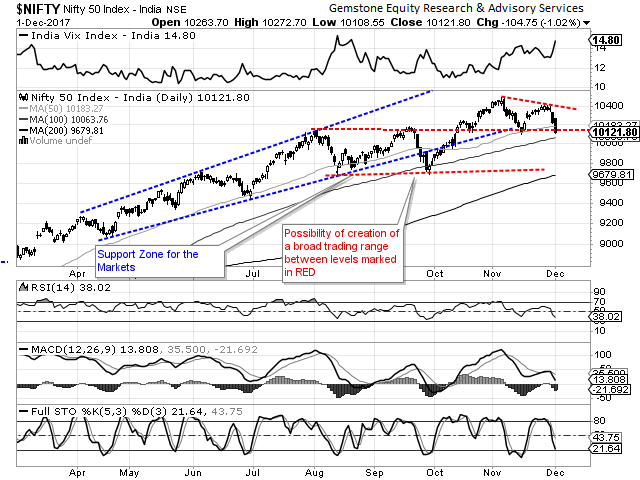 It also shows bearish divergence as the RSI has marked fresh 14-period low while the NIFTY has not. Daily MACD stays bearish while trading below its signal line. The pattern analysis confirms the creation of 10410 as a lower top for the Markets. It would be important to see how the Markets behave vis-à-vis the 100-DMA. In this year, the NIFTY has taken support around 100-DMA multiple number of times. The brighter point from the Friday’s session was that the overall volumes in the Markets remained much lower than the previous session. With the addition in the Open Interest with the decline in the volumes, we can hope that the selling is fading out. This may not immediately halt the downsides but certainly, we can expect the Markets to attempt to take respite and find some immediate base. We recommend avoiding shorts and keeping overall exposures moderate while keeping a cautious view on the Markets.